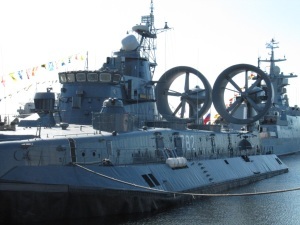 Mordovia (serial number 103) is a Project 12322 Zubr air-cushion landing ship. The ship is designed for taking aboard landing parties and combat vehicles from prepared or unprepared coast, sea lift, landing them ashore and providing fire support. In addition, the ship is capable to carry and lay mines. Thanks to design features of the air cushion, the ship is capable to move on the land bypassing minor obstacles (ditches, trenches) and minefields, move on bogs and land troops in enemy's rear. The ship was built by the Primorsky Shipyard (current name Almaz Shipbuilding Firm). The ship was commissioned into Baltic Fleet on October 15, 1991 as MDK-94, and renamed into Mordovia on March 12, 2001.